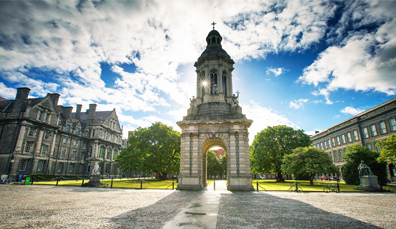 Repeatedly voted Europe’s friendliest city, Dublin is the perfect place to dip your toe in Irish culture. For starters, the City of 1000 Welcomes is a free initiative that pairs first-time visitors with Dubliners who are proud to share their favorite spots. 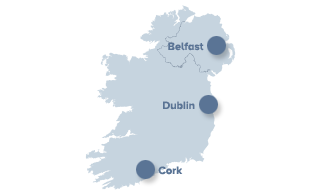 Ask about the Little Museum of Dublin, which condenses the Fair City’s 20th century into free, hourly guided tours and can be found just a short stroll from Trinity College, home of that wonder of ancient Ireland, the Book of Kells. Affectionately known as the Rebel County, Cork – on the southwest coast – has a big personality and takes huge pride in its cultural history. 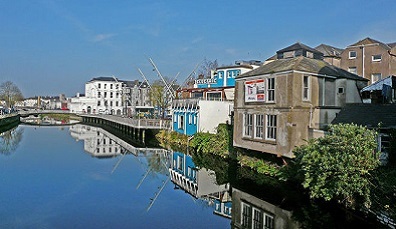 If the weather is fine, stroll down the ancient Cornmarket Street from the city center and across the River Lee to be served a slice of history at Shandon’s renowned Butter Museum. 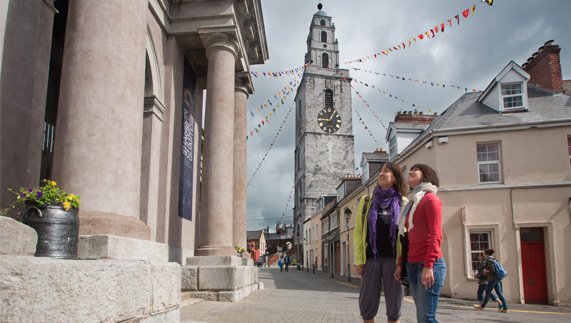 Little old Cork was home to the world’s largest butter market in the 1860s; now, the museum sits within earshot of the iconic Church of St Anne and the Shandon Bells, where you can ring out your stay while enjoying 360° views of the city. Not to be outdone, a trip to Belfast and the awe-inspiring Titanic Belfast exhibition promises a day to remember. 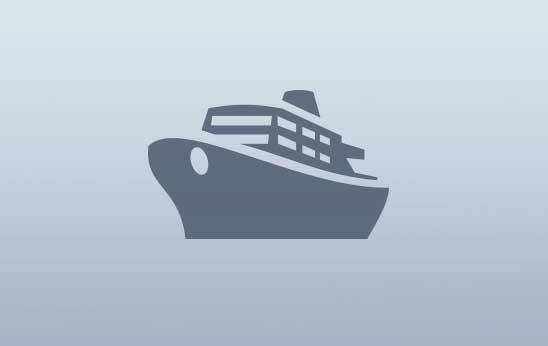 Nine interactive galleries allow you to immerse yourself in the ship’s construction yards, float through ghostly footage of dives to the wreckage and debunk myths about the Titanic’s tragic end in 1912. 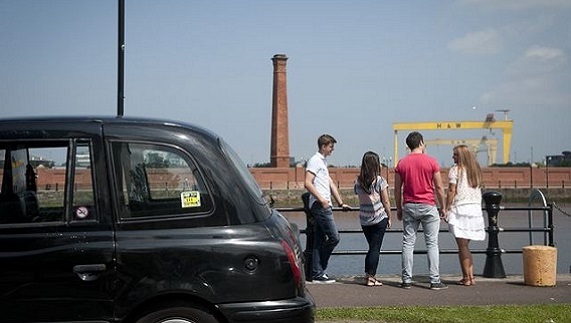 For a more modern city experience, the customizable Black Cab Tour brings you through Belfast’s transformation throughout the past 50 years, showcasing everything from the political murals to the world’s longest Peace Wall. To the west, perched in the middle of the Wild Atlantic Way, is Galway. You’ll feel Ireland’s cultural heart beating strongly here in the nation’s diverse and bohemian City of Tribes. Galway perfectly balances the traditional with the new: a skip away from the historic Spanish Arch and Museum, you’ll catch a show at the legendary Druid Theatre – and you might even run into a mind-boggling street performance by Macnas along the way. It’s also the place to be for festivals, with the theatre, dance and workshops of Baboró Children’s Arts Festival an absolute treat for those seeking a special Irish experience for the whole family. Want to walk in the footsteps of some of the world's literary greats? 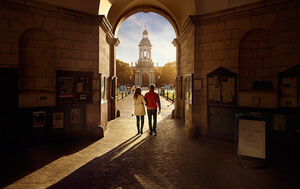 Discover Dublin this fall and make your own story. 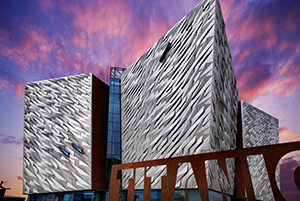 Modern, dynamic and home of the epic Titanic Experience and a buzzing foodie scene: take a bite out of Belfast. Get those taste buds ready, if it's food, cozy pubs or incredible art you're after, Cork's perfect for a fall vacation. Ireland’s foodie scene has risen to the limelight in the last few years and Dublin has been blazing the trail. The greatest local and international favorites can be found at Fallon and Byrne, which stocks tasty bites from pumpkin pasta to creamy mille feuilles – perfect for intrepid explorers on the go, or for those who want to sit in. For something a little more indulgent, you’ll find a real treat and possibly the finest steak dinner in the city at Shanahan’s on the Green. The real Irish experience, however, could also lie at the end of a day’s sightseeing, in the depths of a steaming-hot, vinegar-drowned bag of Leo Burdock’s fish and chips. 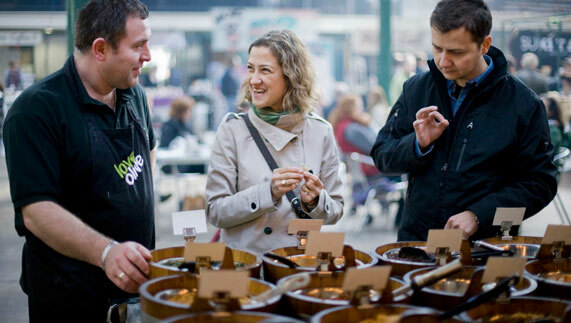 Offering every culinary delight from artisanal meat and spices to local cheese and chocolate, Cork’s English Market is a feast for the senses; it’s no wonder chef Rick Stein calls it “the best covered market in the UK and Ireland”. Each visitor receives the same warm welcome as Her Majesty, Queen Elizabeth II, who fell for the classic Cork banter of fishmonger Pat O’Connell during her historic 2011 visit. Thirty minutes away is Kinsale’s award-winning Fishy Fishy Café; you’ll dream about their fragrant salmon and spring onion tempura for days. Market heaven! The people of Cork are so lucky to have such a great market. It was like Chelsea Market in NYC, but with a decidedly Irish flavor. When in Northern Ireland’s capital city, it would be simply madness not to venture into St George’s Market – this is roaring, bustling Belfast at its best, with sizzling black pudding salads, gravy-soaked Irish stew and the signature Ulster Fry awaiting the hungry visitor. 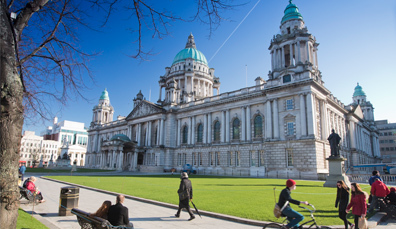 Another tasty way to get to know the city is via the Belfast Bred Walking Tour, where anyone feeling a nip in the air is sure to be warmed by the Mourne Seafood Bar’s salt and chilli squid, or the volcanic rock-seared steak at McHugh’s. Last but certainly not least for those of you on the foodie crew is Galway. Kick-start your day here with the caffeinated punch of freshly ground coffee and tasty pastry at Goya’s Bakery and Café, before trying one of the four Gourmet Tart Outlets dotted around the city for lunch. The award-winning sweet and savory tarts of this family-owned business are made with artisanal produce and really are something special. For a quirky evening meal, Ard Bia at Nimmos is a little different; its diverse menu of Irish, Middle Eastern and New Zealand dishes is sure to get your taste-buds tingling. The Brazen Head in Dublin is Ireland's oldest pub, dating all the way back to 1198. Every visitor to Ireland seeks out the craic and conversation to be found at the beating heart of the community: the pub. On Dublin’s Literary Pub Crawl, you’ll experience the city through the watering holes loved by the city’s greatest writers and artists. Starting at The Duke, a favorite of U2’s Bono, you will cover a multitude, ending with Davy Byrne’s, of James Joyce’s Ulysses fame. Of course, no trip to Dublin would be complete without a visit to the historic Guinness Storehouse, home to the world-famous stout since 1759. Once you pull your own pint of the black stuff in the Gravity Bar, you’ll see what all the fuss is about. The cozy, converted apothecary of Arthur Mayne’s wine bar is Cork’s premiere place to sample a glass from the state-of-the-art enomatic wine system. Nestled in a nook beside bustling local favorite, the Crane Lane Theatre, Mayne’s benefits from an energetic atmosphere while staying in its own little bubble. Meanwhile, those seeking the thrum of a bodhrán (traditional drum) and fiddle, need only pop down the road to the traditional gem, An Spailpín Fánach. 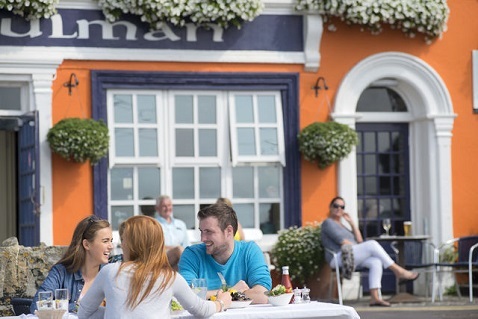 A lucky patron of Kinsale’s Bulman, meanwhile, might catch a fisherman arriving with that evening’s mackerel; fried right in the fireplace, it’s served crispy and fresh with the tang of the sea. 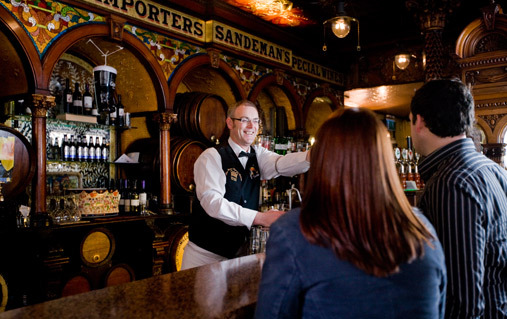 Up in Belfast’s Crown Liquor Saloon, this time capsule of a pub is decorated with intricate Italian paneling and sumptuous leather seating, intended originally for the Titanic, but used by local shipyard workers to pay their bar tabs. 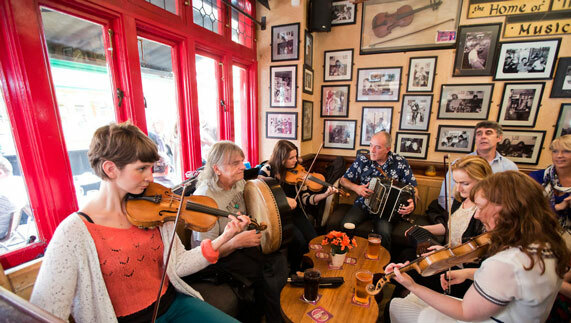 Across the city, McHugh’s is one of Belfast’s oldest pubs – as well as being one of the jewels in the city’s culinary crown – and is a five-minute walk from the unmissable traditional music of The John Hewitt. Meanwhile, Galway is not to be outdone where music and comedy are concerned. Let the Róisín Dubh prove why it’s one of the most famous and reliable venues in the country, or share in the multi-generational trad sessions that make Tigh Cóilí a favourite amongst locals and blow-ins alike. For a more traditional experience, visit Freeney’s; half-pub with Galway’s best whiskey selection, half-fishing tackle shop, you can sit outside on High Street with a cold pint, watching the world go by. 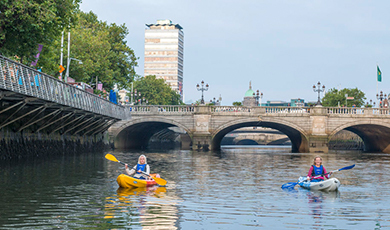 Bracing swims, city-centre kayaking and thrilling cycling trails: prepare for a real adrenaline rush as you explore Dublin's adventurous side! Buzzing Belfast has it all. 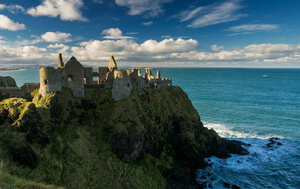 And it makes a great base from which to explore some of Northern Ireland's most intriguing sights. 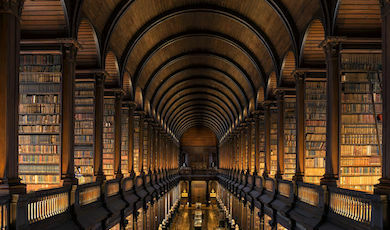 Ireland’s literary romance really is one for the books. Our stories are written into the land, our poetic traditions ancient and our authors celebrated the world over. 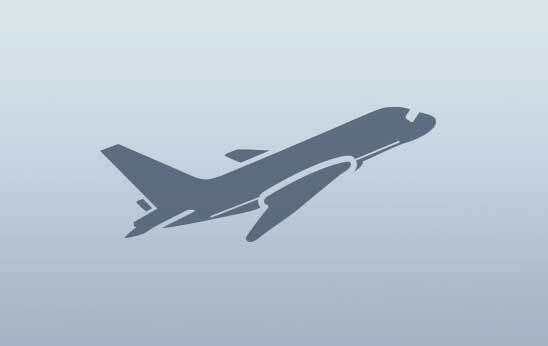 For €300 pps 3 Nights Accommodation & Dinner for two. Unique venues, outstanding festivals and : get lost in the rhythm of Cork city’s rousing music scene. Head outside Dublin city for boat trips to islands, kitesurfing, kayaking among seals and beautiful beaches. 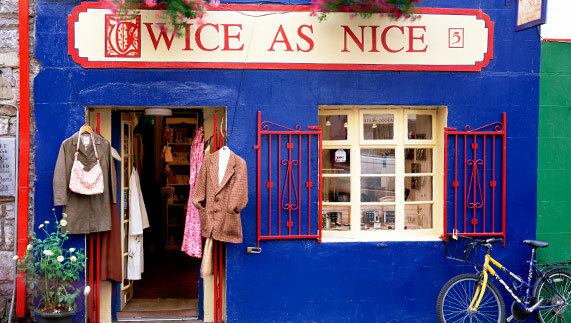 Historic, creative and endlessly quirky, Dublin's many quarters invite you to dive in and live like a local. Tracey Bardon, tour guide at 14 Henrietta Street, tells us what sets Dublin’s tenement museum apart. Behind Bram Stoker, creator of Dracula, and the annual Dublin festival that honours the man and his monster. For a hauntingly vivid look back through Ireland’s history, a trip to Kilmainham is a must. See Northern Ireland’s Valyrian steel – recreated to celebrate season 6. 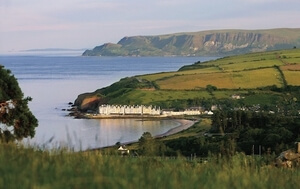 Let the Haven Coast be your safe harbour, as you explore the Wild Atlantic Way. 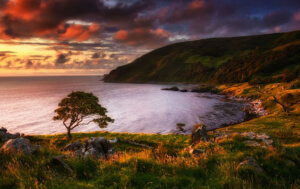 Walking the cliffs, coastal trails and country lanes of Ireland’s north coast will make you fall in love with this land! There’s a whole world of villages, coast, mountains and activities just outside Dublin city.